The Warehouse Studio in Vancouver’s Downtown Eastside doesn’t look all that spectacular at first glance. However, the history of the oldest brick building in Vancouver is as enthralling as the origin of the city itself. In 1989, the rockstar Bryan Adams bought this half burnt-out and dilapidated building and he had it refurbished for a significant amount of money. In 1887, 102 years earlier, it had been built for the German Oppenheimer brothers for their grocery wholesale business. Later, the building became the new city of Vancouver’s first Town Hall, and one of the brothers, David Oppenheimer, made it all the way to the top in 1888. David Oppenheimer was born in 1832 in Blieskastel, then a part of Bavaria. Like many other Germans, he emigrated to America in order to escape to chaos of the German revolutions of 1848 and 1849. Together with his four brothers, he moved first to New Orleans, then to California for the gold rush. There, the brothers founded The Oppenheimer Group in 1858, outfitting the golddiggers with mining equipment. Eventually, the gold rush in the Fraser River Valley lured them further north. While three of the brothers carried on with the business in the valley, David Oppenheimer recognized the potential represented by property speculation in the area of modern-day Vancouver. In 1878, he moved to Coal Harbour in Vancouver (then called Granville) with his brother Isaac to buy land there. Six years later, David Oppenheimer had so much influence that he successfully lobbied the government of British Columbia at the time to relocate the main railroad hub from Port Moody to Coal Harbour. Because of the move, this location, which was later to become Vancouver, would gain a lot of economic importance. By pure chance, the land near the railway terminus in Coal Harbour belonged to David Oppenheimer. Having won over the Canadian Pacific Railway, Oppenheimer was already set for life, but it was about more than money for the ambitious David Oppenheimer. His goals were even loftier. When the city of Vancouver was founded in 1886, David and Isaac each got a seat on the new city council. Two years later, David Oppenheimer was elected the second mayor of Vancouver. During his term, he accomplished a variety of things, and the city still commemorates him to this day. 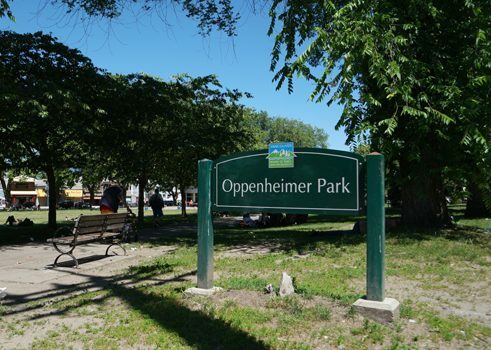 There is a bust of him at the Stanley Park end of Beach Avenue, a park in Japantown in the Downtown Eastside was named after him, and in south Vancouver you can find the David Oppenheimer Elementary School. 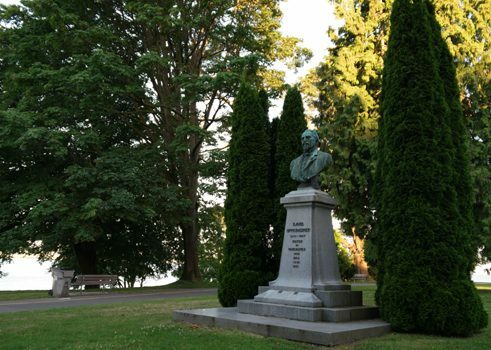 After his Canadian Pacific Railway gambit, he was significantly involved in founding Stanley Park, and he campaigned heavily for expanding Vancouver’s infrastructure, such as extending the streetcar network and building roads, canals, and an electrical system. David Oppenheimer resigned in 1891 - officially because of health reasons. However, his rival William Templeton, who he had defeated in the election, spread another version of events. Allegedly, Oppenheimer’s private business interests had taken the upper hand and were in conflict with his official functions. David Oppenheimer died of a heart attack on New Year’s Eve in 1897 - one day before his 64th birthday. William Templeton was elected mayor that same year, and he promptly had Oppenheimer Street renamed to East Cordova. David Oppenheimer’s body lay in state at the Freemasons’ temple located at the corner of Cambie and Cordova at the time. Later, he was buried in a Jewish cemetery in Brooklyn, NY. However, his personal legacy has remained: the Oppenheimer Group still exists, and today it is lovingly referred to as ‘Oppy’.